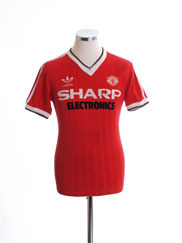 Since their first dabblings in the world of sports apparel in the 1960s (as opposed to simply footwear) adidas (note the lower case ‘a’) have commanded a position of respect throughout football with strong relationships with UEFA and FIFA cementing their status as one of the world’s leading sportswear brands. 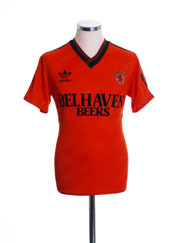 The early decades of the firm saw them specialise solely in sports footwear, supplying local football teams as well as the German national side for whom adidas produced the first ever removable studs. They also produced athletic footwear at this time and rapidly began to dominate the sport. 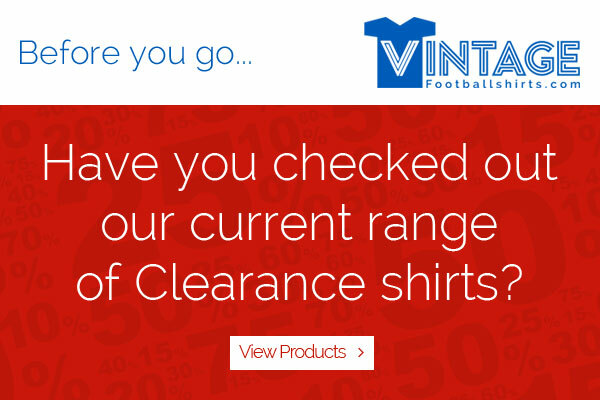 It wasn’t until the mid 1960s that the company moved into sports clothing with their brand presence rapidly increasing in the early 1970s when the appearance of brand logos on apparel became common. As well as their logo (the original ‘trefoil’ design first launched in 1972), adidas are fortunate in their shrewd use of their ‘three stripes’ trim - a graphic device that is now trademarked and makes adidas products instantly recognisable. There’s no doubt that the three stripes (first unveiled in 1962 as part of a tracksuit range) have given adidas a strong advantage in the highly competitive world of sportswear promotion and marketing. 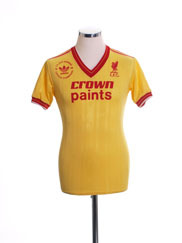 Although the firm dominated the athletics footwear market (and made impressive inroads into football boots which in the UK at the time were distributed by Umbro) the 1970s saw their football clothing grow in stature with exposure to the UK coming thanks to mainly international matches where many continental sides were beginning to sport adidas strips. Adidas didn’t stop at boots and clothing though - in 1970 they moved into football production and since then virtually every major worldwide football event has seen the sides use adidas balls. 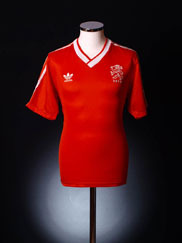 In England the first sides to wear adidas appeared in 1977 with Nottingham Forest, Ipswich and Fulham amongst the sides to feature the three stripes in the domestic game. 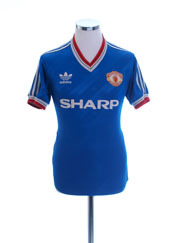 As the 80s arrived more and more sides took to adidas with the firm taking over many previous Admiral contracts including Crystal Palace and Manchester United (who adidas dressed for over a decade) after the firm went into liquidation. Founder Adi Dassler, died in 1978 before seeing his company dominate world football apparel. His son, Horst, took over the company but on his death nine years later it was bought by French businessman Bernard Tapie. Unfortunately Tapie’s financial dealings were highly suspect and under the threat of bankruptcy he was forced to hand over adidas to Credit Lyonnais, the French bank who had loaned him the money to make the purchase originally. Another Frenchman, Robert Louis-Dreyfus, eventually bought the company in 1993. 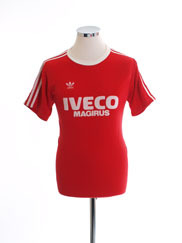 Louis-Dreyfus was also president of Marseille and adidas to this day, still produce some massively innovative strips for the French club. In fact, all of the strips the company produce for the French domestic league are acclaimed for their invention and creativity. 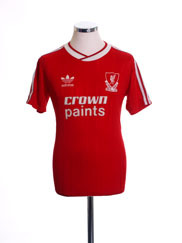 In 1985 the then mighty Liverpool side signed with adidas and Arsenal also joined the firm’s high profile roster of English clubs. 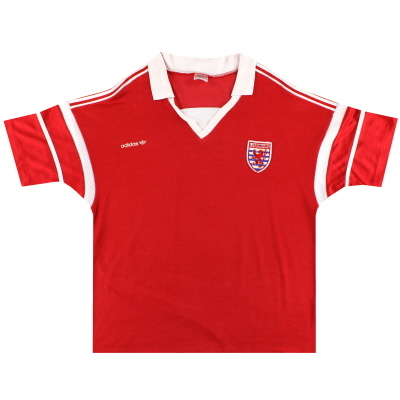 Internationally, the German national side where never to be seen in anything but adidas and many other European sides such as France, also favoured the company throughout the years. 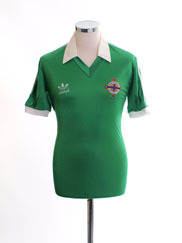 Northern Ireland and Wales also wore adidas strips during the 80s. With such an instantly recognisable and powerful brand, the firm took a risk in 1991 with the rebranding of the company into ‘adidas equipment’, focusing on performance fabrics and products. 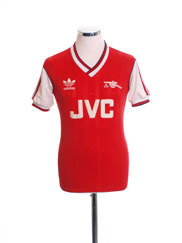 Gone were the three stripe trim and in came large, bold panels of colour and a new logo. The rebranding could not really be classed as a success though and the firm stumbled, in the UK at least, with a unclear brand direction. By the mid 90s though gradually the dust settled and adidas in the UK consolidated. The big name club contracts were gone and instead the three stripes began to appear in the lower leagues with Newcastle United becoming the only major English club in the firm’s roster. 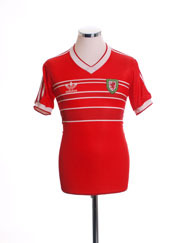 The logo dropped ‘equipment’ and returned to being simply ‘adidas’ although the new logo remained with the traditional trefoil design consigned to heritage/retro products. 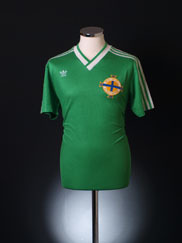 With the arrival of the new millennium adidas’ reign of world football kits was increasingly under threat from a rapidly growing influx of Nike designs and those of arch rivals Puma who still had a strong presence in international football, especially with the African League of Nations cup. In 2004 adidas joined forces with English designer Stella McCartney and her designs for Team GB were proudly worn in the 2012 London Olympics. 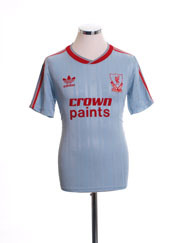 In 2005 adidas bought English sportswear firm Reebok and regained control of the Liverpool kit contract in a deal that was to last seven years. 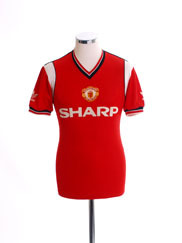 Still today, adidas remain an archetype in terms of solid and modern football kit design, holding strong against their rivals and producing quality kits throughout international and domestic football. 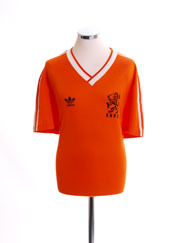 Their designs are forever forward looking (although some retro design elements have began to creep in recent years) with their unmissable strong branding in the form of the three stripes and their logo ensuring that when one thinks of football kits they tend to think of adidas.